Spindles and Spices: Happy Lunar New Year! Happy New Year, folks! I hope the Year of the Snake brings everyone good fortune and much happiness. We celebrated last night with four mousse cakes, potato leek soup with dill, and a simple dinner of vegetarian tan tan noodles. It was an odd combination, but since we decided to not eat out, that's what I was able to make with the food in the refrigerator. A friend came over and helped me cook, and she brought champaign (bubbles are a must for special events) and the cakes. One Chinese tradition that I find hard to stick with is to not sweep your floors, the idea being that sweeping your floors sweeps out all the good luck. Did the people who made these rules have cats or a dog who sheds his own body weight every 2 weeks? Or a house in the middle of a fireplace remodel? I think not! So, my workaround it that I'll vacuum and keep the vacuum in the house for the week. That way, the good luck can still marinate our house, because after last year, we need it! For the vegetarian tan tan noodles, I made quite a few substitutions using ingredients that we already had on hand. 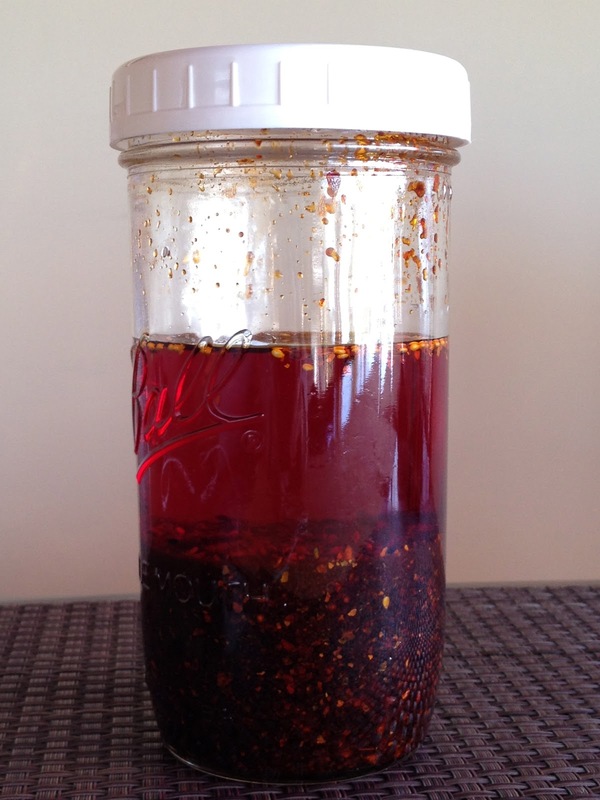 The recipe, loosely adapted from Fuchsia Dunlop's new book Every Grain of Rice: Simple Chinese Home Cooking, calls for roasted chili oil and its sediment. Interestingly, one of her substitutions for dried, ground Sichuan chiles is to use Korean chile flakes. I usually have a big jar of Korean chile flakes on hand since I use them for kimchi and Korean chicken stew, so putting together the oil was a simple matter of weighing out the flakes, heating the oil, and adding them together with crushed ginger and sesame seeds. I love it when I don't have to run to the store for a specialty item, especially if I have to go the Chinese market whose parking situation is perilous at best, and just plain whacked out near Chinese New Year. Another specialty item that I subbed out was the Sichuan fermented vegetables, ya cai. Since I only need 1.5 ounces of the stuff, I used kimchi instead since I had a jar aging in the refrigerator. It was perfect! We topped the noodles with toasted sesame oil (which I'm going to make next time in the blender), roasted chile oil, and finely diced shitake mushrooms and kimchi. I felt a little sheepish serving my friend refrigerator dregs, but in the end, I shouldn't have said anything because our dinner was delicious. I'm not a stickler about food being authentic so long as it tastes good, an attitude that reflects California cuisine. Since it is cold in this house all the time (hence the fireplace remodel that includes adding a gas insert), my kombucha is fermenting slowly. 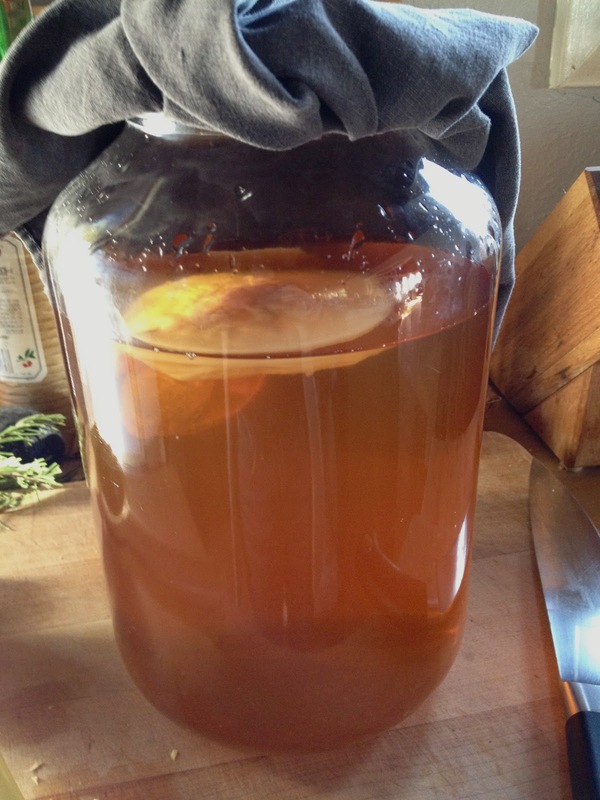 Ideally, kombucha should be kept at 80°F. Our house has been hovering around 50-60°F, but the SCOBY is still doing its thing. I made a big batch of Jasmine tea, added sugar, and floated the SCOBY on top. The tiny bit of kombucha from my last batch has been blended with tangerine juice, ginger, and bottled so I can enjoy it later this week with a little fizz. My two workers are sleeping on the job! Although we did the fireplace demo work, we decided to hire a mason to put up the ledgestone. Being people who like to DIY, it is strange to have someone in your house to do work that you feel you should be doing. However, the job this guy is doing is so much better than anything we would do because he has experience, the proper tools like a wet saw, and a lot more patience that us - he told me that he has to talk to the stone to figure out where it should go. The only talking we do when we're building things consists of expletives, so I can't imagine we are nurturing our projects. So, the only reason I'm mentioning this is because I have a huge craving for kimchi fried rice or something else smelly to eat for lunch every time the mason and his assistant are over. Out of courtesy, I am not cooking said smelly foods although I'm sure they would be polite and not say anything if I did so. (I'm wondering now if cooking black bean chicken was pushing the smell factor a little too much, but I had to eat!) It gets to the point where I wish we were doing the work so I could eat my smelly foods with abandon, but I know that this craving stems in part because I'm telling myself I cannot do something. This is why dieting is something I cannot ever do, or else I'd be 3 times bigger. I have to concentrate on the wonderful things I can eat, not the things that I shouldn't eat, and make sure that junk food doesn't exist at our house. Happy new year to you, too! In solidarity, I'm not sweeping, either. And my hairdresser insisted that she cut my hair last week, before the new year. No haircuts this week; that would be cutting my luck!